This was work created for the 2018 Pantone Color of the Year exhibit being put on by the UICA starting April 6. It's new work inspired by the color ultraviolet. When I think of this color I naturally think glow in the dark futuristic space woman. On a deeper level what we see is a lone woman on her adventures. Navigating spaces and having to survive on her own. She is in situations where she is alienated and not like the rest but still having to strive for the best. This collection includes a bracelet, necklace, and 3 rings. The self, the ship to get her there, and places in time where she's been, is, and is going. 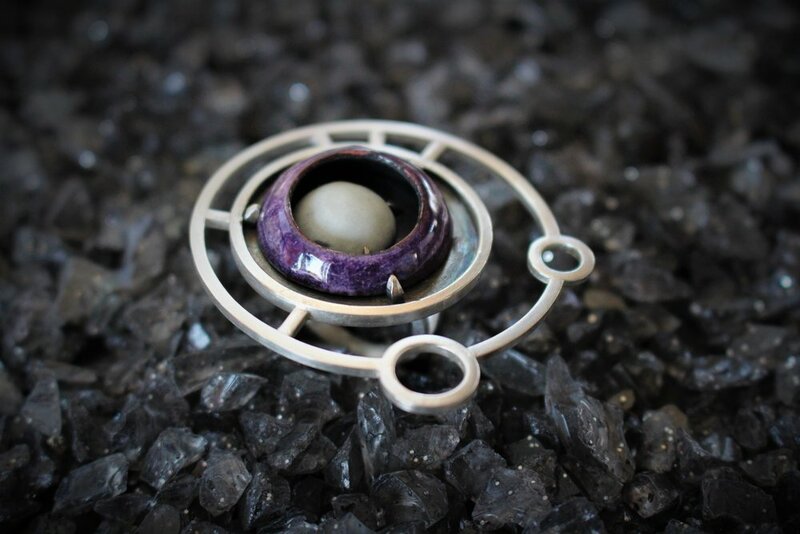 I kept my original style of fragmented futuristic nouveau punk with wire form sterling silver and experimented with enamel and phosphorescent powder. So this was a new experience too. I've never branded myself with my own t-shirt and lapel pins before. But, I figured with my collection being in the UICA for the show, it would be a great way for people to have a little piece of my work and what she stands for. The major bonus on top of affordability and coolness is, of course, they glow in the dark!